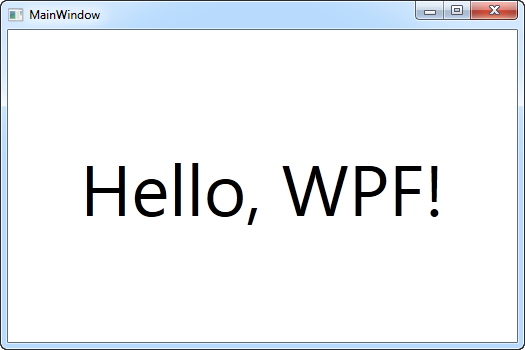 WPF, which stands for Windows Presentation Foundation, is Microsoft's latest approach to a GUI framework, used with the .NET framework. But what IS a GUI framework? GUI stands for Graphical User Interface, and you're probably looking at one right now. Windows has a GUI for working with your computer, and the browser that you're likely reading this document in has a GUI that allows you to surf the web. A GUI framework allows you to create an application with a wide range of GUI elements, like labels, textboxes and other well known elements. Without a GUI framework you would have to draw these elements manually and handle all of the user interaction scenarios like text and mouse input. This is a LOT of work, so instead, most developers will use a GUI framework which will do all the basic work and allow the developers to focus on making great applications. There are a lot of GUI frameworks out there, but for .NET developers, the most interesting ones are currently WinForms and WPF. 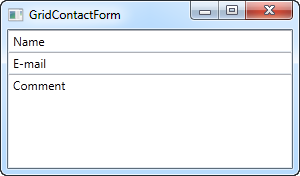 WPF is the newest, but Microsoft is still maintaining and supporting WinForms. As you will see in the next chapter, there are quite a few differences between the two frameworks, but their purpose is the same: To make it easy to create applications with a great GUI. In the previous chapter, we talked about what WPF is and a little bit about WinForms. In this chapter, I will try to compare the two, because while they do serve the same purpose, there is a LOT of differences between them. If you have never worked with WinForms before, and especially if WPF is your very first GUI framework, you may skip this chapter, but if you're interested in the differences then read on. The single most important difference between WinForms and WPF is the fact that while WinForms is simply a layer on top of the standard Windows controls (e.g. 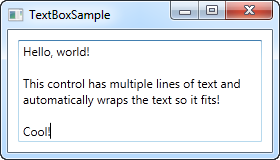 a TextBox), WPF is built from scratch and doesn't rely on standard Windows controls in almost all situations. This might seem like a subtle difference, but it really isn't, which you will definitely notice if you have ever worked with a framework that depends on Win32/WinAPI. A great example of this is a button with an image and text on it. This is not a standard Windows control, so WinForms doesn't offer you this possibility out of the box. Instead you will have to draw the image yourself, implement your own button that supports images or use a 3rd party control. 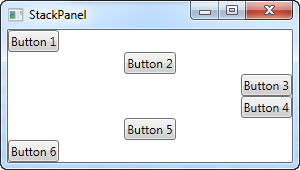 With WPF, a button can contain anything because it's essentially a border with content and various states (e.g. untouched, hovered, pressed). 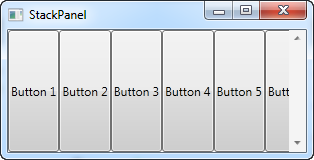 The WPF button is "look-less", as are most other WPF controls, which means that it can contain a range of other controls inside of it. You want a button with an image and some text? Just put an Image and a TextBlock control inside of the button and you're done! You simply don’t get this kind of flexibility out of the standard WinForms controls, which is why there's a big market for rather simple implementations of controls like buttons with images and so on. The drawback to this flexibility is that sometimes you will have to work harder to achieve something that was very easy with WinForms, because it was created for just the scenario you need it for. At least that's how it feels in the beginning, where you find yourself creating templates to make a ListView with an image and some nicely aligned text, something that the WinForms ListViewItem does in a single line of code. This was just one difference, but as you work with WPF, you will realize that it is in fact the underlying reason for many of the other differences - WPF is simply just doing things in its own way, for better and for worse. You're no longer constrained to doing things the Windows way, but to get this kind of flexibility, you pay with a little more work when you're really just looking to do things the Windows way. 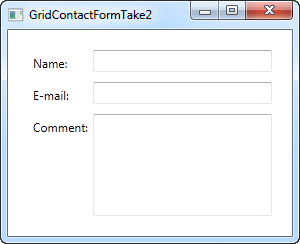 The following is a completely subjective list of the key advantages for WPF and WinForms. It should give you a better idea of what you're going into. WPF is, as already described, a combination of XAML (markup) and C#/VB.NET/any other .NET language. All of it can be edited in any text editor, even Notepad included in Windows, and then compiled from the command line. However, most developers prefer to use an IDE (Integrated Development Environment), since it makes everything, from writing code to designing the interface and compiling it all so much easier. The preferred choice for a .NET/WPF IDE is Visual Studio, which costs a lot quite a bit of money though. Luckily, Microsoft has decided to make it easy and absolutely free for everyone to get started with .NET and WPF, so they have created a free version of Visual Studio, called Visual Studio Express. This version contains less functionality than the real Visual Studio, but it has everything that you need to get started learning WPF and make real applications. The latest version, as of writing this text, is Microsoft Visual Studio Express 2012. To create WPF applications, you should get the Windows Desktop edition, which can be downloaded for free from this website: http://www.microsoft.com/visualstudio/eng/products/visual-studio-express-for-windows-desktop. After downloading and installing, you can use this product for 30 days without any registration. After that, you will need to register it on the above mentioned website, which is also completely free. The rest of this tutorial assumes that you have an IDE installed, preferably Visual Studio or Visual Studio Express (see the previous article for instructions on how to get it). If you're using another product, you will have to adapt the instructions to your product. Of course the above example could be written less explicitly and using more syntactical sugar, but I think the point still stands: XAML is pretty short and concise for describing interfaces. Simply press the [Tab] key twice to have Visual Studio generate the correct event handler for you, right below the current method, ready for imeplentation. When you subscribe to the events like this, you don't need to do it in XAML. As you can see, the Window1 class is definied as partial, because it's being combined with your XAML file in runtime to give you the full window. This is actually what the call to InitializeComponent() does, which is why it's required to get a full functioning window up and running. If we go back to the XAML file, you will notice a couple of other interesting attributes on the Window element, like Title, which defines the title of the window (shown in the title bar) as well as the starting width and height. There are also a couple of namespace definitions, which we will talk about in the XAML chapters. 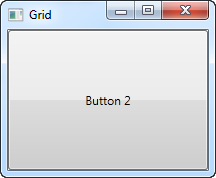 You will also notice that Visual Studio has created a Grid control for us inside the Window. 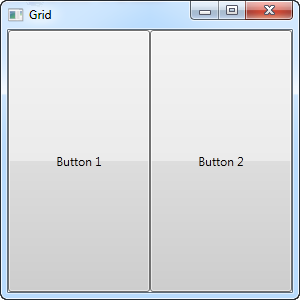 The Grid is one of the WPF panels, and while it could be any panel or control, the Window can only have ONE child control, so a Panel, which in turn can contain multiple child controls, is usually a good choice. Later in this tutorial, we will have a much closer look into the different types of panels that you can use, as they are very important in WPF. Icon - Allows you to define the icon of the window, which is usually shown in the upper right corner, right before the window title. ResizeMode - This controls whether and how the end-user can resize your window. The default is CanResize, which allows the user to resize the window like any other window, either by using the maximize/minimize buttons or by dragging one of the edges. CanMinimize will allow the user to minimize the window, but not to maximize it or drag it bigger or smaller. NoResize is the strictest one, where the maximize and minimize buttons are removed and the window can't be dragged bigger or smaller. ShowInTaskbar - The default is true, but if you set it to false, your window won't be represented in the Windows taskbar. Useful for non-primary windows or for applications that should minimize to the tray. SizeToContent - Decide if the Window should resize itself to automatically fit its content. The default is Manual, which means that the window doesn't automatically resize. 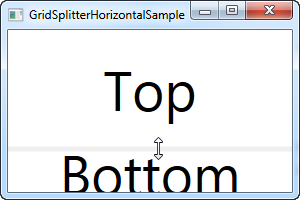 Other options are Width, Height and WidthAndHeight, and each of them will automatically adjust the window size horizontally, vertically or both. Topmost - The default is false, but if set to true, your Window will stay on top of other windows unless minimized. Only useful for special situations. WindowStartupLocation - Controls the initial position of your window. The default is Manual, which means that the window will be initially positioned according to the Top and Left properties of your window. Other options are CenterOwner, which will position the window in the center of it's owner window, and CenterScreen, which will position the window in the center of the screen. WindowState - Controls the initial window state. It can be either Normal, Maximized or Minimized. The default is Normal, which is what you should use unless you want your window to start either maximized or minimized. 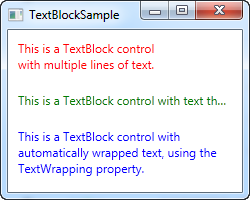 TextBlock is not a control, per se, since it doesn't inherit from the Control class, but it's used much like any other control in the WPF framework, so we'll call it a control to keep things simple. 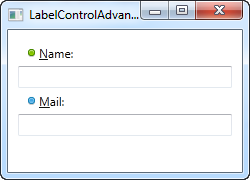 The TextBlock control is one of the most fundamental controls in WPF, yet it's very useful. It allows you to put text on the screen, much like a Label control does, but in a simpler and less resource demanding way. A common understanding is that a Label is for short, one-line texts (but may include e.g. an image), while the TextBlock works very well for multiline strings as well, but can only contain text (strings). Both the Label and the TextBlock offers their own unique advantages, so what you should use very much depends on the situation. That's as simple as it comes and if you have read the previous chapters of this tutorial, then there should be nothing new here. The text between the TextBlock is simply a shortcut for setting the Text property of the TextBlock. with multiple lines of text. This is a TextBlock control with text that may not be rendered completely, which will be indicated with an ellipsis. This is a TextBlock control with automatically wrapped text, using the TextWrapping property. The red TextBlock uses a LineBreak tag to manually break the line at a designated location. This gives you absolute control over where you want the text to break onto a new line, but it's not very flexible for most situations. If the user makes the window bigger, the text will still wrap at the same position, even though there may now be room enough to fit the entire text onto one line. The green TextBlock uses the TextTrimming property with the value CharacterEllipsis to make the TextBlock show an ellipsis (...) when it can't fit any more text into the control. This is a common way of showing that there's more text, but not enough room to show it. This is great when you have text that might be too long but you absolutely don't want it to use more than one line. As an alternative to CharacterEllipsis you may use WordEllipsis, which will trim the text at the end of the last possible word instead of the last possible character, preventing that a word is only shown in part. The blue TextBlock uses the TextWrapping property with the value Wrap, to make the TextBlock wrap to the next line whenever it can't fit anymore text into the previous line. Contrary to the first TextBlock, where we manually define where to wrap the text, this happens completely automatic and even better: It's also automatically adjusted as soon as the TextBlock get more or less space available. Try making the window in the example bigger or smaller and you will see how the wrapping is updated to match the situation. This was all about dealing with simple strings in the TextBlock. In the next chapter, we'll look into some of the more advanced functionality of the TextBlock, which allows us to create text of various styles within the TextBlock and much more. In the last article we looked at the core functionality of the TextBlock control: Displaying a simple string and wrapping it if necessary. We even used another color than the default for rendering the text, but what if you wanted to do more than just define a static color for all the text in the TextBlock? Luckily the TextBlock control supports inline content. These small control-like constructs all inherit from the Inline class, which means that they can be rendered inline, as a part of a larger text. As of writing, the supported elements include AnchoredBlock, Bold, Hyperlink, InlineUIContainer, Italic, LineBreak, Run, Span, and Underline. In the following examples, we'll have a look at most of them. TextBlock with <Bold>bold</Bold>, <Italic>italic</Italic> and <Underline>underlined</Underline> text. Much like with HTML, you just surround your text with a Bold tag to get bold text and so on. This makes it very easy to create and display diverse text in your applications. All three of these tags are just child classes of the Span element, each setting a specific property on the Span element to create the desired effect. For instance, the Bold tag just sets the FontWeight property on the underlying Span element, the Italic element sets the FontStyle and so on. Simply inserts a line break into the text. Please see the previous chapter for an example where we use the LineBreak element. This text has a <Hyperlink RequestNavigate="Hyperlink_RequestNavigate" NavigateUri="https://www.google.com">link</Hyperlink> in it. The Run element allows you to style a string using all the available properties of the Span element, but while the Span element may contain other inline elements, a Run element may only contain plain text. This makes the Span element more flexible and therefore the logical choice in most cases. So as you can see, if none of the other elements doesn't make sense in your situation or if you just want a blank canvas when starting to format your text, the Span element is a great choice. It's great to have the possibility, and it can be necessary to do it like this in some cases, but this example will probably make you appreciate XAML even more. Another thing you might notice is the fact that the Label, by default, has a bit of padding, allowing the text to be rendered a few pixels away from the top, left corner. This is not the case for the TextBlock control, where you will have to specify it manually. In a simple case like this, where the content is simply a string, the Label will actually create a TextBlock internally and show your string in that. The last bullet point is actually one of the main reasons for using a Label over the TextBlock control. Whenever you just want to render simple text, you should use the TextBlock control, since it's lighter and performs better than the Label in most cases. The screenshot shows our sample dialog as it looks when the Alt key is pressed. Try running it, holding down the [Alt] key and then pressing N and M. You will see how focus is moved between the two textboxes. So, there's several new concepts here. First of all, we define the access key by placing an underscore (_) before the character. It doesn't have to be the first character, it can be before any of the characters in your label content. The common practice is to use the first character that's not already used as an access key for another control. We use the Target property to connect the Label and the designated control. We use a standard WPF binding for this, using the ElementName property, all of which we will describe later on in this tutorial. The binding is based on the name of the control, so if you change this name, you will also have to remember to change the binding. This is just an extended version of the previous example - instead of a simple text string, our Label will now host both and image and a piece of text (inside the AccessText control, which allows us to still use an access key for the label). Both controls are inside a horizontal StackPanel, since the Label, just like any other ContentControl derivate, can only host one direct child control. The Image control, described later in this tutorial, uses a remote image - this is ONLY for demonstrational purposes and is NOT a good idea for most real life applications. 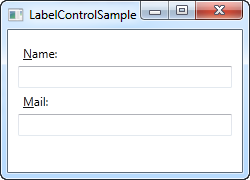 The TextBox control is the most basic text-input control found in WPF, allowing the end-user to write plain text, either on a single line, for dialog input, or in multiple lines, like an editor. Try right-clicking in the TextBox. You will get a menu of options, allowing you to use the TextBox with the Windows Clipboard. The default keyboard shortcuts for undoing and redoing (Ctrl+Z and Ctrl+Y) should also work, and all of this functionality you get for free! I have added two properties: The AcceptsReturn makes the TextBox into a multi-line control by allowing the use of the Enter/Return key to go to the next line, and the TextWrapping property, which will make the text wrap automatically when the end of a line is reached. 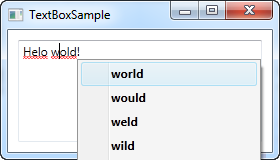 We have used the previous, multi-line textbox example as the basis and then I have added two new properties: The attached property from the SpellCheck class called IsEnabled, which simply enables spell checking on the parent control, and the Language property, which instructs the spell checker which language to use. SelectionStart , which gives us the current cursor position or if there's a selection: Where it starts. SelectionLength , which gives us the length of the current selection, if any. Otherwise it will just return 0. SelectedText , which gives us the currently selected string if there's a selection. Otherwise an empty string is returned. All of these properties are both readable and writable, which means that you can modify them as well. 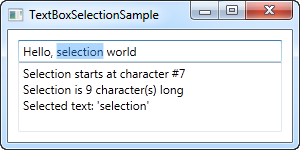 For instance, you can set the SelectionStart and SelectionLength properties to select a custom range of text, or you can use the SelectedText property to insert and select a string. Just remember that the TextBox has to have focus, e.g. by calling the Focus() method first, for this to work. As you can see, the CheckBox is very easy to use. On the second CheckBox, I use the IsChecked property to have it checked by default, but other than that, no properties are needed to use it. The IsChecked property should also be used from Code-behind if you want to check whether a certain CheckBox is checked or not. As you can see from the sample markup, you can do pretty much whatever you want with the content. On all three check boxes, I do something differently with the text, and on the middle one I even throw in an Image control. By specifying a control as the content, instead of just text, we get much more control of the appearance, and the cool thing is that no matter which part of the content you click on, it will activate the CheckBox and toggle it on or off. As mentioned, the CheckBox usually corresponds to a boolean value, which means that it only has two states: true or false (on or off). However, since a boolean data type might be nullable, effectively allowing for a third option (true, false or null), the CheckBox control can also support this case. By setting the IsThreeState property to true, the CheckBox will get a third state called "the indeterminate state". 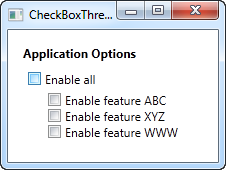 This example works from two different angles: If you check or uncheck the "Enable all" CheckBox, then all of the child check boxes, each representing an application feature in our example, is either checked or unchecked. It also works the other way around though, where checking or unchecking a child CheckBox affects the "Enable all" CheckBox state: If they are all checked or unchecked, then the "Enable all" CheckBox gets the same state - otherwise the value will be left with a null, which forces the CheckBox into the indeterminate state. All of this behavior can be seen on the screenshots above, and is achieved by subscribing to the Checked and Unchecked events of the CheckBox controls. In a real world example, you would likely bind the values instead, but this example shows the basics of using the IsThreeState property to create a "Toggle all" effect. The RadioButton control allows you to give your user a list of possible options, with only one of them selected at the same time. You can achieve the same effect, using less space, with the ComboBox control, but a set of radio buttons tend to give the user a better overview of the options they have. All we do is add a Label with a question, and then three radio buttons, each with a possible answer. We define a default option by using the IsChecked property on the last RadioButton, which the user can change simply by clicking on one of the other radio buttons. This is also the property you would want to use from Code-behind to check if a RadioButton is checked or not. With the GroupName property set on each of the radio buttons, a selection can now be made for each of the two groups. Without this, only one selection for all six radio buttons would be possible. Markup-wise, this example gets a bit heavy, but the concept is pretty simple. For each RadioButton, we have a WrapPanel with an image and a piece of text inside of it. Since we now take control of the text using a TextBlock control, this also allows us to format the text in any way we want to. For this example, I have changed the text color to match the choice. An Image control (read more about those later) is used to display an image for each choice. Notice how you can click anywhere on the RadioButton, even on the image or the text, to toggle it on, because we have specified it as content of the RadioButton. If you had placed it as a separate panel, next to the RadioButton, the user would have to click directly on the round circle of the RadioButton to activate it, which is less practical. 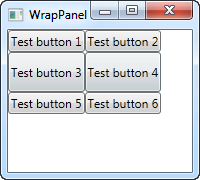 Panels are one of the most important control types of WPF. They act as containers for other controls and control the layout of your windows/pages. Since a window can only contain ONE child control, a panel is often used to divide up the space into areas, where each area can contain a control or another panel (which is also a control, of course). Panels come in several different flavors, with each of them having its own way of dealing with layout and child controls. Picking the right panel is therefore essential to getting the behavior and layout you want, and especially in the start of your WPF career, this can be a difficult job. The next section will describe each of the panels shortly and give you an idea of when to use it. After that, move on to the next chapters, where each of the panels will be described in detail. 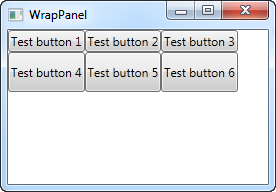 A simple panel, which mimics the WinForms way of doing things. It allows you to assign specific coordinates to each of the child controls, giving you total control of the layout. This is not very flexible though, because you have to manually move the child controls around and make sure that they align the way you want them to. Use it (only) when you want complete control of the child control positions. The WrapPanel will position each of its child controls next to the other, horizontally (default) or vertically, until there is no more room, where it will wrap to the next line and then continue. Use it when you want a vertical or horizontal list controls that automatically wraps when there's no more room. The StackPanel acts much like the WrapPanel, but instead of wrapping if the child controls take up too much room, it simply expands itself, if possible. Just like with the WrapPanel, the orientation can be either horizontal or vertical, but instead of adjusting the width or height of the child controls based on the largest item, each item is stretched to take up the full width or height. 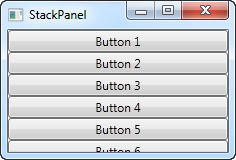 Use the StackPanel when you want a list of controls that takes up all the available room, without wrapping. 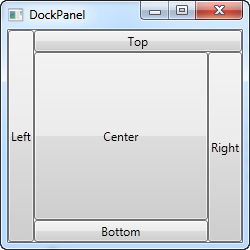 The DockPanel allows you to dock the child controls to the top, bottom, left or right. By default, the last control, if not given a specific dock position, will fill the remaining space. 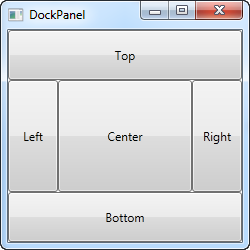 You can achieve the same with the Grid panel, but for the simpler situations, the DockPanel will be easier to use. 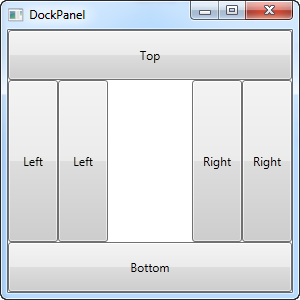 Use the DockPanel whenever you need to dock one or several controls to one of the sides, like for dividing up the window into specific areas. 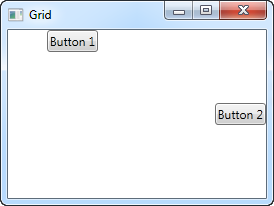 The Grid is probably the most complex of the panel types. A Grid can contain multiple rows and columns. You define a height for each of the rows and a width for each of the columns, in either an absolute amount of pixels, in a percentage of the available space or as auto, where the row or column will automatically adjust its size depending on the content. Use the Grid when the other panels doesn't do the job, e.g. when you need multiple columns and often in combination with the other panels. The UniformGrid is just like the Grid, with the possibility of multiple rows and columns, but with one important difference: All rows and columns will have the same size! Use this when you need the Grid behavior without the need to specify different sizes for the rows and columns. The Canvas is probably the simplest Panel of them all. It doesn't really do anything by default, it just allows you to put controls in it and then position them yourself using explicit coordinates. 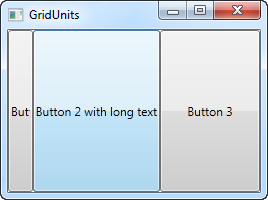 If you have ever used another UI library like WinForms, this will probably make you feel right at home, but while it can be tempting to have absolute control of all the child controls, this also means that the Panel won't do anything for you once the user starts resizing your window, if you localize absolutely positioned text or if the content is scaled. As you can see, even though we have two buttons, they are both placed in the exact same place, so only the last one is visible. The Canvas does absolutely nothing until you start giving coordinates to the child controls. 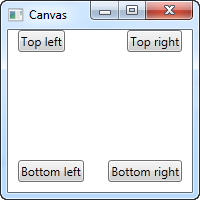 This is done using the Left, Right, Top and Bottom attached properties from the Canvas control. Notice how I only set the property or properties that I need. For the first two buttons, I only wish to specify a value for the X axis, so I use the Left and Right properties to push the buttons towards the center, from each direction. For the bottom buttons, I use both Left/Right and Bottom to push them towards the center in both directions. You will usually specify either a Top or a Bottom value and/or a Left or a Right value. As mentioned, since the Canvas gives you complete control of positions, it won't really care whether or not there's enough room for all your controls or if one is on top of another. 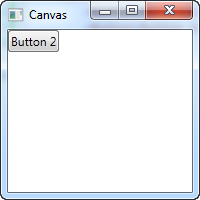 This makes it a bad choice for pretty much any kind of dialog design, but the Canvas is, as the name implies, great for at least one thing: Painting. 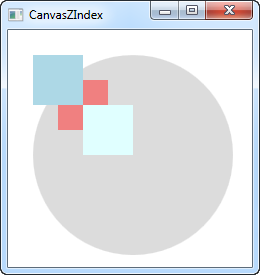 WPF has a bunch of controls that you can place inside a Canvas, to make nice illustrations. In the next example, we'll use a couple of the shape related controls of WPF to illustrate another very important concept when using the Canvas: Z-Index. Normally, if two controls within a Canvas overlaps, the one defined last in the markup will take precedence and overlap the other(s). However, by using the attached ZIndex property on the Panel class, this can easily be changed. The default ZIndex value is 0, but we assign a new one to each of the shapes. The rule is that the element with the higher z-index overlaps the ones with the lower values. If two values are identical, the last defined element "wins". As you can see from the screenshot, changing the ZIndex property gives quite another look. When the WrapPanel uses the Horizontal orientation, the child controls will be given the same height, based on the tallest item. When the WrapPanel is the Vertical orientation, the child controls will be given the same width, based on the widest item. Notice how I set a specific height on one of the buttons in the second row. In the resulting screenshot, you will see that this causes the entire row of buttons to have the same height instead of the height required, as seen on the first row. You will also notice that the panel does exactly what the name implies: It wraps the content when it can't fit any more of it in. In this case, the fourth button couldn't fit in on the first line, so it automatically wraps to the next line. You can see how the buttons go vertical instead of horizontal, before they wrap because they reach the bottom of the window. In this case, I gave a wider width to the fourth button, and you will see that the buttons in the same column also gets the same width, just like we saw with the button height in the Horizontal example. Notice how button 5 only uses the width - it doesn't care about the height, although it causes the sixth button to be pushed to a new column. The first thing you should notice is how the StackPanel doesn't really care whether or not there's enough room for the content. It doesn't wrap the content in any way and it doesn't automatically provide you with the ability to scroll (you can use a ScrollViewer control for that though - more on that in a later chapter). As you can see, the controls still go from top to bottom, but instead of having the same width, each control is aligned to the left, the right or center. In this example, we have simply divided the available space into two columns, which will share the space equally, using a "star width" (this will be explained later). On the second button, I use a so-called Attached property to place the button in the second column (0 is the first column, 1 is the second and so on). I could have used this property on the first button as well, but it automatically gets assigned to the first column and the first row, which is exactly what we want here. As you can see, the controls take up all the available space, which is the default behavior when the grid arranges its child controls. It does this by setting the HorizontalAlignment and VerticalAlignment on its child controls to Stretch. As you can see from the resulting screenshot, the first button is now placed in the top and centered. The second button is placed in the middle, aligned to the right. 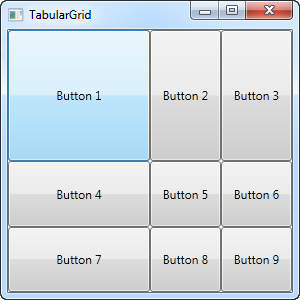 A total of nine buttons, each placed in their own cell in a grid containing three rows and three columns. We once again use a star based width, but this time we assign a number as well - the first row and the first column has a width of 2*, which basically means that it uses twice the amount of space as the rows and columns with a width of 1* (or just * - that's the same). 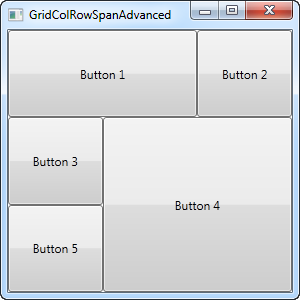 You will also notice that I use the Attached properties Grid.Row and Grid.Column to place the controls in the grid, and once again you will notice that I have omitted these properties on the controls where I want to use either the first row or the first column (or both). This is essentially the same as specifying a zero. This saves a bit of typing, but you might prefer to assign them anyway for a better overview - that's totally up to you! As you saw in the previous articles, the Grid panel makes it very easy to divide up the available space into individual cells. Using column and row definitions, you can easily decide how much space each row or column should take up, but what if you want to allow the user to change this? This is where the GridSplitter control comes into play. As you can see, I've simply created a Grid with two equally wide columns, with a 5 pixel column in the middle. Each of the sides are just a TextBlock control to illustrate the point. 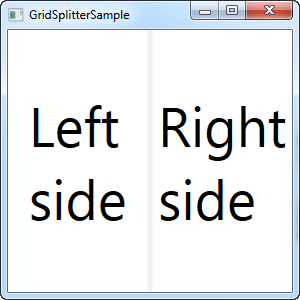 As you can see from the screenshots, the GridSplitter is rendered as a dividing line between the two columns and as soon as the mouse is over it, the cursor is changed to reflect that it can be resized. As you can see, I simply changed the columns into rows and on the GridSplitter, I defined a Height instead of a Width. 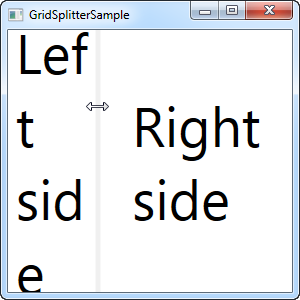 The GridSplitter figures out the rest on its own, but in case it doesn't, you can use the ResizeDirection property on it to force it into either Rows or Columns mode. In the last couple of chapters we went through a lot of theoretic information, each with some very theoretic examples. 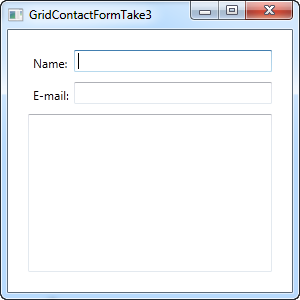 In this chapter we will combine what we have learned about the Grid so far, into an example that can be used in the real world: A simple contact form. The good thing about the contact form is that it's just an example of a commonly used dialog - you can take the techniques used and apply them to almost any type of dialog that you need to create. 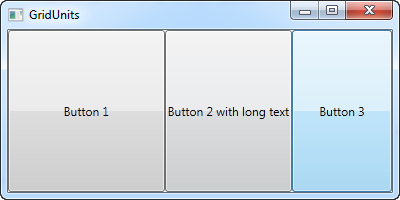 As you can see, the last TextBox simply takes up the remaining space, while the first two only takes up the space they require. Try resizing the window and you will see the comment TextBox resize with it. So as you can see, the Grid is a very powerful panel. Hopefully you can use all of these techniques when designing your own dialogs. In the previous article we saw how changes in a TextBox was not immediately sent back to the source. Instead, the source was updated only after focus was lost on the TextBox. This behavior is controlled by a property on the binding called UpdateSourceTrigger. It defaults to the value "Default", which basically means that the source is updated based on the property that you bind to. As of writing, all properties except for the Text property, is updated as soon as the property changes (PropertyChanged), while the Text property is updated when focus on the destination element is lost (LostFocus). Default is, obviously, the default value of the UpdateSourceTrigger. The other options are PropertyChanged, LostFocus and Explicit. The first two has already been described, while the last one simply means that the update has to be pushed manually through to occur, using a call to UpdateSource on the Binding. As you can see, each of the three textboxes now uses a different UpdateSourceTrigger. The first one is set to Explicit, which basically means that the source won't be updated unless you manually do it. For that reason, I have added a button next to the TextBox, which will update the source value on demand. In the Code-behind, you will find the Click handler, where we use a couple of lines of code to get the binding from the destination control and then call the UpdateSource() method on it. The second TextBox uses the LostFocus value, which is actually the default for a Text binding. It means that the source value will be updated each time the destination control loses focus. The third and last TextBox uses the PropertyChanged value, which means that the source value will be updated each time the bound property changes, which it does in this case as soon as the text changes. Try running the example on your own machine and see how the three textboxes act completely different: The first value doesn't update before you click the button, the second value isn't updated until you leave the TextBox, while the third value updates automatically on each keystroke, text change etc. The UpdateSourceTrigger property of a binding controls how and when a changed value is sent back to the source. However, since WPF is pretty good at controlling this for you, the default value should suffice for most cases, where you will get the best mix of a constantly updated UI and good performance. For those situations where you need more control of the process, this property will definitely help though. Just make sure that you don't update the source value more often than you actually need to. If you want the full control, you can use the Explicit value and then do the updates manually, but this does take a bit of the fun out of working with data bindings. So far in this tutorial, we have mostly created bindings between UI elements and existing classes, but in real life applications, you will obviously be binding to your own data objects. This is just as easy, but once you start doing it, you might discover something that disappoints you: Changes are not automatically reflected, like they were in previous examples. As you will learn in this article, you need just a bit of extra work for this to happen, but fortunately, WPF makes this pretty easy. There are two different scenarios that you may or may not want to handle when dealing with data source changes: Changes to the list of items and changes in the bound properties in each of the data objects. How to handle them may vary, depending on what you're doing and what you're looking to accomplish, but WPF comes with two very easy solutions that you can use: The ObservableCollection and the INotifyPropertyChanged interface. Try running it for yourself and watch how even though you add something to the list or change the name of one of the users, nothing in the UI is updated. The example is pretty simple, with a User class that will keep the name of the user, a ListBox to show them in and some buttons to manipulate both the list and its contents. 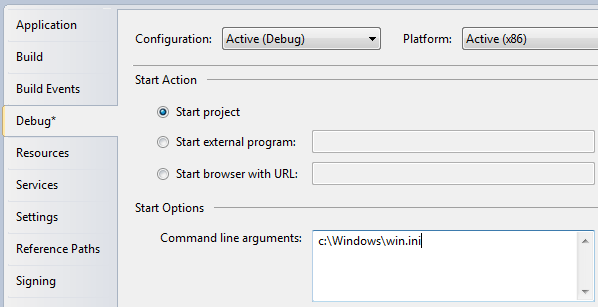 The ItemsSource of the list is assigned to a quick list of a couple of users that we create in the window constructor. The problem is that none of the buttons seems to work. Let's fix that, in two easy steps. The first step is to get the UI to respond to changes in the list source (ItemsSource), like when we add or delete a user. What we need is a list that notifies any destinations of changes to its content, and fortunately, WPF provides a type of list that will do just that. It's called ObservableCollection, and you use it much like a regular List<T>, with only a few differences. In the final example, which you will find below, we have simply replaced the List<User> with an ObservableCollection<User> - that's all it takes! This will make the Add and Delete button work, but it won't do anything for the "Change name" button, because the change will happen on the bound data object itself and not the source list - the second step will handle that scenario though. The second step is to let our custom User class implement the INotifyPropertyChanged interface. By doing that, our User objects are capable of alerting the UI layer of changes to its properties. This is a bit more cumbersome than just changing the list type, like we did above, but it's still one of the simplest way to accomplish these automatic updates. As you can see, implementing INotifyPropertyChanged is pretty easy, but it does create a bit of extra code on your classes, and adds a bit of extra logic to your properties. This is the price you will have to pay if you want to bind to your own classes and have the changes reflected in the UI immediately. Obviously you only have to call NotifyPropertyChanged in the setter's of the properties that you bind to - the rest can remain the way they are. The ObservableCollection on the other hand is very easy to deal with - it simply requires you to use this specific list type in those situations where you want changes to the source list reflected in a binding destination. Are you looking to make cash from your websites/blogs by running popup ads? If so, did you ever use Pop Ads?